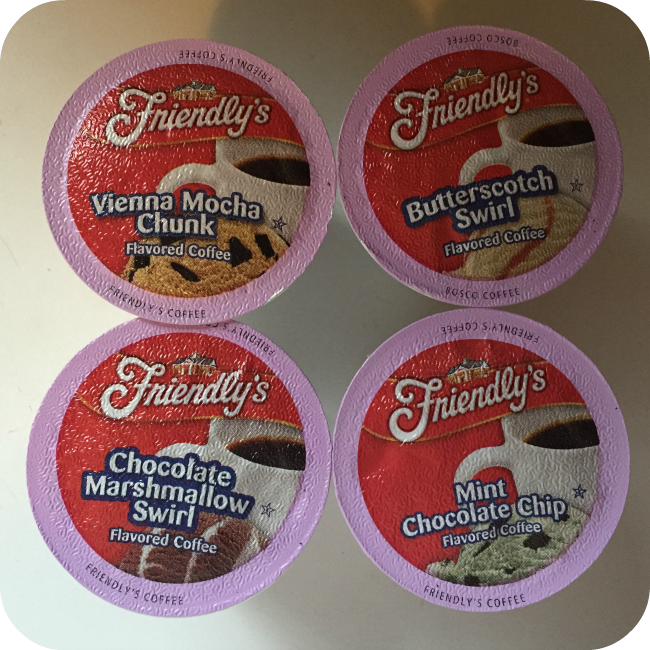 I actually had never heard of Friendly's when I signed up to review this coffee. I love coffee and I love sharing my love of coffee with others, but apparently Friendly's is a restaurant? And they serve breakfast, dinner, and ice cream. And Two Rivers Coffee Co. has put the last one in a k-cup. I was sent a 40-ct. box Friendly's Single Serve...in coffee cup form to review. Now you can enjoy the taste of all your favorite ice cream flavors in your coffee mug. Buttery butterscotch, creamy chocolate marshmallow, decadent Vienna mocha chunk, and cool mint chocolate chip-these flavored coffees will satisfy the biggest ice cream craving without all those pesky calories. Try the friendly's ice cream flavored variety pack and savor the sweetness with someone special. Friendly's is just one of many brands from Two Rivers Coffee Co. I worked with them on a review earlier this year for a wonderful variety pack, you can check out that review HERE. I have also included Friendly's Coffee in my Holiday Gift Guide. I think I could make some awesome creative baskets with this. 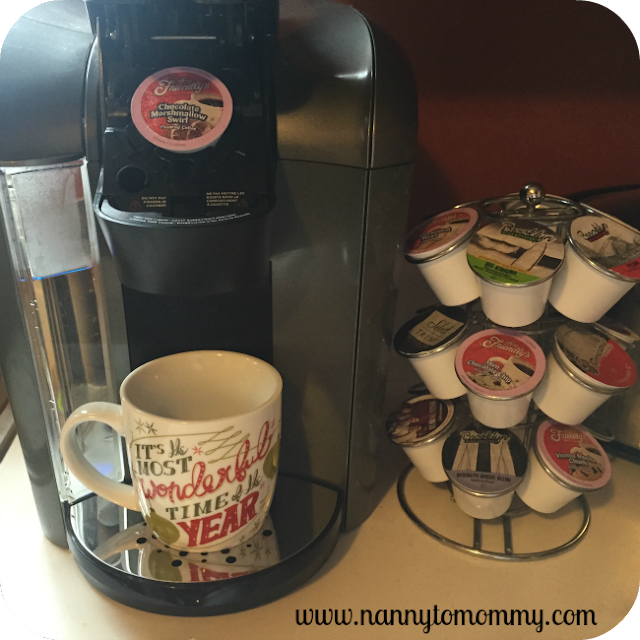 One Nanny to Mommy reader will win a Friendly's Single-Cup Coffee for Keurig K-Cup Brewers Variety Pack, 40 Count of their very own! Giveaway open to US only, must be 18+ to enter. One entrant per household/IP address. Winner chosen via random.org through Rafflecopter. All winning entries are verified. Please make sure to follow us on Facebook to stay up to date on all of our current giveaways and Good Luck! Thank you for stopping by the Gobbling Up the Giveaways giveaway hop! Hosted by The Anti-June Cleaver and Our Piece of Earth. Nanny to Mommy, The Anti-June Cleaver, Our Piece of Earth, and the rest of the bloggers participating in the Gobbling Up The Giveaways hop are not responsible for sponsors who do not fulfill prize obligations. I would like to try Vienna Mocha Chunk. i would love to try the Butterscotch Swirl flavor! i have never heard of coffee in that flavor! I want to try the chocolate marshmallow swirl.They all sound delicious.I have never heard of or seen these before.Thanks for the chance to win some. I would love to try the chocolate marshmallow swirl,these sound so yummy,I want to try all of them! I'd <3 to try the Mint Chocolate Chip. I loved Friendly's ice cream when I was a kid! I'd like to try the Vienna Mocha Chunck! Which flavor would you like to try most? Chocolate marshmallow swirl sounds absolutely amazing!!! I would love to try the Chocolate Marsh mellow Swirl! Actually they all sound really good, it's a hard pick. But my first choice would be the Vienna Mocha Chunk, yum! I would like to try Chocolate marshmallow swirl. I want to try the Vienna Mocha Chunk first, then the Chocolate Mint, then the...! :) Yum! The Vienna Mocha Chip sounds good, because you know what I was thinking would be great? Coffee ice cream flavored coffee. Vienna Mocha Chunck sounds good! I can't wait to try the Vienna Mocha Chunk, it sounds really good and I think I would like it. Thank you. I want to try the butterscotch swirl the most. They all sound good though! Tough question! I'd love to try them all, but I'd probably drool the most over the Butterscotch one!! I think I would like to try the Butterscotch Swirl! I would like to try Butterscotch Swirl the most! Ok- I want to try all first, but if I have to pick, it would be the butterscotch swirl!!! Vienna mocha chunk!!! That sounds delectable! I would love to try the Chocolate Marsh Mellow Swirl it sounds so good! Vienna Mocha Chunk is the flavor I want to try the most. I am most excited to try the Vienna mocha chunk flavored coffee the most. I would like to try chocolate marshmallow swirl. That sounds yummy. I would most like to try the Mint Chocolate Chip flavored coffee. I want to try the chocolate marshmallow swirl.......it sounds amazing!!! They all sound fantastic but I think I'd try the mint chocolate chip first. I'd most like to try Chocolate Marshmallow Swirl. Thanks. I would love to try the Butterscotch Swirl. Chocolate Marshmellow Swirl! Didn't know they had coffee to buy! I would like to try the chocolate marshmallow swirl. The flavor I would try first is chocolate marshmallow swirl. butterscotch swirl sounds really good! I really want to try the chocolate marshmallow swirl. Sounds yummy!! The one I'm most interested in trying is the Vienna Mocha Chunk since that one is the flavor I order the most whenever I get a sundae at my local Friendly's. I'd love to try the Vienna Mocha Chunk. I most like to try the Vienna Mocha Chunk. I think they all sound delicious though. I would like to try the chocolate marshmallow swirl. Sounds yummy! I want to try the Chocolate Marshmallow first! I would love to try Vienna Mocha Chunk -- it sounds amazing. They all look great!